Booklet 1 of 6 in the Knowing God series. In this teaching, Martha explores how the enemy works through life’s events to cause us to draw conclusions about God: that He lies, that He is not good, and that He withholds what we need. In the Garden of Eden, Eve’s exchange with the Serpent revealed Satan’s great lie about God, a lie woven into the very essence of our unredeemed human nature. This lie is so potent that it colors every area of our lives, a foundational tenet of evil that we barely notice. Satan’s great lie presents us with a regular temptation to see God as something other, something less than He truly is. It is absolutely vital for us to recognize the lie and to allow the Holy Spirit to expose it and root it out of our hearts. Why? Because without that work, we will not know God in His vast magnificence and tenderness and mystery. We will miss the eternal destiny He has for us as our lives are slowly poisoned by the darkness of this great lie. Crisis and trouble will overtake us because the lie has blinded us to the Solution we so desperately need. Our lives, our destinies, our very peace hangs in the balance of our acceptance or rejection of this hideous lie. 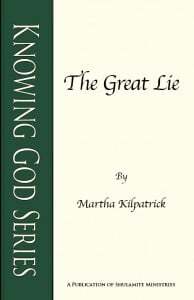 In The Great Lie, Martha Kilpatrick reveals the lie born in Eden that lives today in you and me. Through scripture and testimony and examples from her own walk with the Lord, Martha paints a shocking picture of the pervasive destruction of this great lie. But more than that, we are shown the reward of refusing it, the healing that occurs when it’s rooted out, and the wonder that awaits every heart untethered from it’s clutches. God is so much more than we can imagine…don’t you want to meet Him in the shining splendor of who He really is? The Great Lie is now available in both print and digital format. I want to ask you to have a special attentiveness and hearing to this passage…like you have never heard it before. For the wrath of God is revealed from heaven against all ungodliness and unrighteousness of men who suppress the truth in unrighteousness because that which is known about God is evident within them; for God made it evident to them. For since the creation of the world His invisible attributes, His eternal power and divine nature, have been clearly seen, being understood through what has been made, so that men are without excuse. God has made clear who He is. From His perspective who He is, is obvious…if you just look at what He has made. We have a thousand excuses, but God says we are without excuse for not knowing who He is – both His power and His divine nature. Has the potter no right over the clay, to make out of the same mass (lump) one vessel for beauty and distinction and honorable use, and another for menial, ignoble and dishonorable use? Shall the thing that is made say of its maker, “He did not make me”? Or the thing that is formed say of him who formed it, “He has no understanding”? Your life is an expression of your idea of God. Notice I didn’t say, “Your idea is an expression of God.” I said, “Your life is an expression—of your idea—of God.” You are living out, and living by, and expressing, and manifesting, and creating…your concept of God. You are like who you think He is. You are just exactly like who you think He is. So it is crucial that who you think He is, be the right perception. We have romantic illusions about God. We take away the dark side. I heard someone do it today. He said, “God doesn’t judge.” God has a mysterious dark side, and if we have a romantic illusion about God, we can take out…what we don’t like. After realizing what He does…comes the impenetrable darkness of finding out who He is. “Has God said you’ll die? Now, he didn’t say, “God is a liar,” because Eve would have refuted that. And you would refute that, too. But what he did say was: “God told a lie,” and Eve concluded, “God is a liar!” Do you see? Very clever. You must learn how clever it is, because it is done to you—day after day. “Indeed, has God said…? No, no. It really won’t happen.” And what Satan took away by his lie, was the consequence of sin. What that means is that there are no consequences. “I can do it and I can get by with it.” One of the first things the Lord gave me was a powerful encounter with consequences. He did it through Matthew 25 in the parable of the talents. I have always been stunned by the consequences to the one who merely buried his talent. That’s all he did—“and he was cast into the place of outer darkness where there is weeping and gnashing of teeth” (v. 30). I don’t understand it—but I understand it well enough—there are consequences! When Satan took that lie and placed it in Eve, it was buried in her being and birthed into us. We have to learn there are consequences to our thoughts, words, and deeds. Satan inferred that God had lied and Eve’s conclusion was: God is a liar! Man’s belief in the consequences of sin was destroyed by the Lie. God has withheld something you need. And anytime in your life that you have had a void, or a want, or God has withheld something…that Lie has come to you! God withholds arsenic from us and Satan suggests that it is what we need- that it is the one thing we need! So again, he suggested something to Eve that caused her to draw a conclusion about God. “He withheld something good, Eve.” Eve’s conclusion: God is not good. I was no prophet (by profession)! Neither was I a prophet’s son, [but I had my occupation]. I was a herdsman and a dresser of sycamore trees and a gatherer of sycamore figs. And the Lord took me as I followed the flock and the Lord said to me, Go, prophesy to My people Israel. Amos had wonderful visions. He was in his life following the flock. Following the flock means he was tending them, taking care of them, going where they strayed and bringing them back. Work—lonely, thankless, tedious, day after day—work. Amos was in his life, living it and communing with God, as a shepherd and as a gardener. And God came to him in his life. If you are not in your life, you won’t be there when God comes in your life to show you your destiny. Do you see? You have got to be in your life so that when God comes in your life—to call you to something new—you’re there. You’re there! Elisha was plowing with his oxen, while all the time up on the mountain God was telling Elijah to anoint him as his successor (1 Kings 19). But Elisha was there plowing. He was in his life. A man who accepts his lot, his place, his occupation, can and will embrace God’s upward call when it comes. He will be able to hear it because he will be practiced in accepting it. God usually calls us when we are able to accept the call. If we are in resistance and not in acceptance, we are not ready. God does not want performance. Did you know that? We think He wants performance. That is something we need to know about God: He doesn’t want performance! He wants acceptance of His will from the heart. We say: “Perform His will? I’ll do it. I’ll do it ‘cause You said, ‘Do it!’” That is not what God wants. He wants: “I’ll do it. It is Your will and because You are good, Your will is good.” That is surrender! God wants surrender…to the life He’s given you. It takes a lot of just plain courage to live in your life. If our response is not surrender to His will, it is rebellion. Even if you perform His will—but haven’t surrendered to it—it is rebellion. God-ordained circumstances are good because He is good, not because they are good in themselves. Do you know that God does not need anything good—in this world, or in us—but Himself? He doesn’t need your life to be good! He is good enough to swallow everything up in His goodness! Why do you call Me good? There is only one good, even the Father. Goodness…there is only one good in the universe, yet I am always expecting people to be good. I am always expecting me to be good! Even the Lord Jesus Christ in His humanity derived His goodness from the goodness of the Father. I am not suggesting that we accept everything that comes— that would be passivity. We are supposed to try the spirits (1 Jn. 4:1). (Let me put that in so that you won’t think I am going too far.) But if we could just accept the unchangeables in life, I believe we would do well.